Another preference question in my 2015 survey. 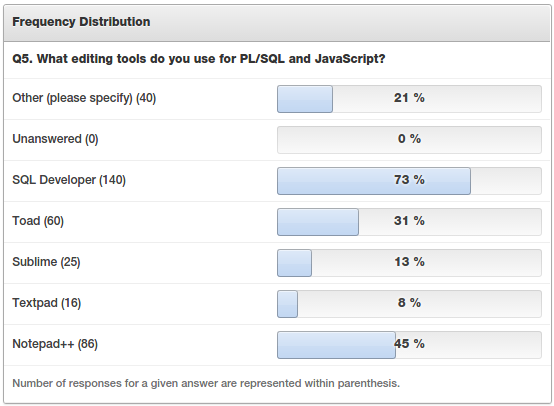 That Jeff Smith fellow should be pretty happy with the top result, but almost half of the "Other" responses said PL/SQL Developer. I used this many years ago while SQL Developer was still being born. Since SQL Developer was free and portable, it was an easy selection, though I only use if for queries, not PL/SQL development. A number of editors were suggested in Other, including two takers for Notepad. All I can say is wow, and I hope for the sake of others that tab characters are not being saved in your files. I've been happily using Textpad almost since I started coding. I'm interested in making the jump to a non OS specific editor like Sublime, or perhaps Atom, but I'm not there yet. Though after watching the Kscope16 deep dive / montage (as a livestream), I want to try soon! 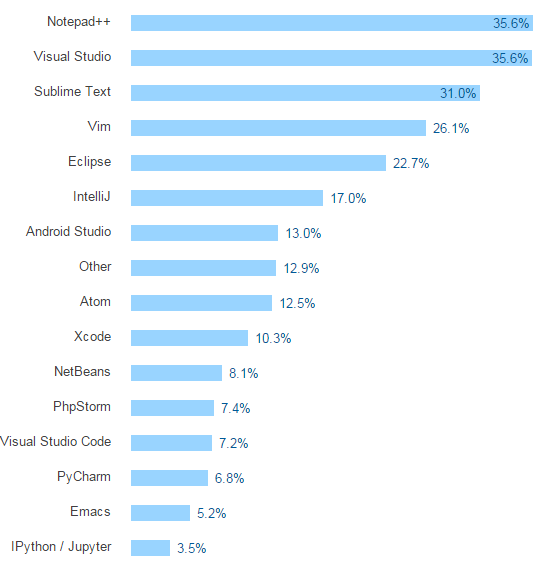 I spotted these results in the 2016 StackOverflow survey, a somewhat more diverse survey than mine. And I've started to use Atom, but I might have to give Sublime a go for a while to compare. Cheers for the list, I was going to use Trent's post to get me going. I've been using Sublime for PL/SQL for a couple of years now (along with a proper IDE for queries). Thinking about trying Atom too soon, but I've no reason to change really. What should I know about SQL?